The Currency Exchange in the Champlain Center has a long history in Plattsburgh. Nayef Durham Dergham founded the business in the 1960s. He worked as a beer salesman and, being a good salesman, was in touch with his clients and their needs. He began to discover that his clients needed to exchange their—mostly—Canadian currency. Local merchants were happy to be patronized by the Canadian tourists, but their transactions were compounded by the issue of foreign currency. Nayef Dergham saw an opportunity, and with the heart of an entrepreneur and the route of a beer salesman, he was perfectly poised to build the foundation for the new business. 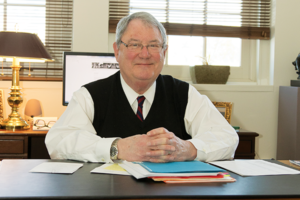 That foundation has supported the exchange for over 50 years and acted as a cornerstone for the Dergham family businesses here in Plattsburgh. It’s hard to tell if Uncle Nayef knew he was leaving a legacy for the next generation from the very first transaction, but he worked tirelessly for his customers. Nadim Dergham operates the exchange now. When Dergham’s Uncle Nayef retired, initially his son (and Nadim Dergham’s cousin), Robert Durham, took over the exchange. 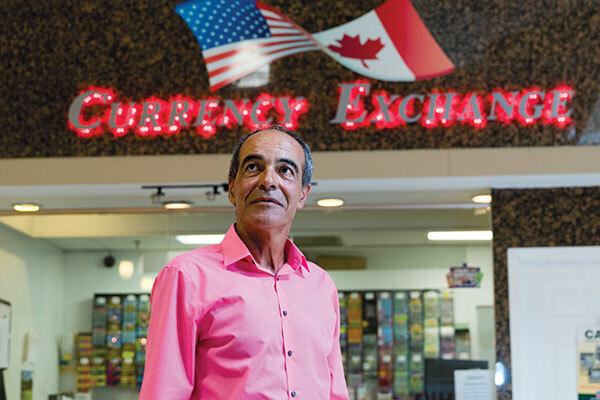 When it came time for his cousin Bob to retire, Nadim Dergham stepped in to run the exchange. Dergham still remembers working alongside his uncle as a young man to learn the ropes. He learned the book of business that, at its peak, required five agents on the road and 12 employees at the exchange. They handled banks, businesses, resorts and merchants from Watertown, New York to Stowe, Vermont and everything in between, including Lake George and Lake Placid. “Dealing with currency is like playing the market every day—constantly monitoring the rate of buying and selling one item. You don’t want to run out, but you’ve got to watch your exposure,” said Dergham. “Your inventory is money and you can’t waste it.” Business was great. But on the day that everything changed, so did the Currency Exchange. The events of 9/11 and the after effects changed the business dramatically. Some of the changes were ephemeral and some permanent. The Patriot Act went into effect in October of 2001. The measures that were taken to prevent laundering and terrorist financing also choked the Mom and Pop currency exchange. The insurance required to do business at the volume that the Currency Exchange had grown to became prohibitive. While not a single client had an objection to the service provided, the Currency Exchange was no longer able to adequately service their larger volume clients. 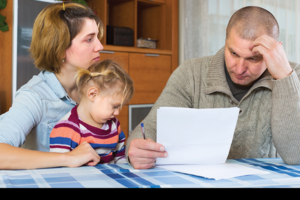 By complying with the new federal measures, they lost 70 percent of their business. Being able to do business under the new circumstances required a tenacity and resilience that you don’t often see. Some might have closed their doors under such adversity, but not Nadim Dergham. In keeping with the Pareto Principle, Dergham needed to focus his attention on the other pieces of his book of business if the exchange was going to remain viable. In addition, he was going to have to diversify his assets to continue to grow the family business. So the family business became the family businesses. As part of the post 9/11 diversification efforts, Dergham opened a limo company and an auto repair shop. The Currency Exchange is still proudly the only location where you can go to get Canadian dollars without having to wait a few days for your bank or credit union to buy those dollars and get them to you. Despite that exclusivity, the Currency Exchange does not place a huge transaction fee on its customers. In fact, they don’t have a service charge at all. They simply offer the monies a few points above prime literally making pennies on the dollar. Located in Champlain Centre, they are open to the public, which means tourists can take advantage of their services. In the past 15 years, walk-up customers have gone from being additional business to being, in large part, what the business relies upon. It’s a good thing their customer service has always been paramount regardless of revenue represented. They have gone from having five agents on the road to one agent. Ever the student, Nadim Dergham studies the mar- kets and trends, and creates his expectations based on the calendar—which Canadian holidays are on the horizon. “It’s consumer driven now, so like all the other merchants, we expect higher traffic around the holidays and so we prepare for that…and watch the rates,” he said with a slow deliberate smile. When Strictly Business asked Dergham about the future of the Currency Exchange he was refreshingly candid when he said, “I don’t know…it remains to be seen.” Dergham continues to keep his fingers on the pulse of the industry of money. Some continue to believe that “Cash is King” and there will never be a replacement for it. Dergham went on to share that, conversely, the broad and unyielding changes to the legal system in an effort to firm up anti-money- laundering legislation have absolutely affected business. e-payment options. Most stores now have atleast one register that is not only self-serve, but takes cards only—no cash. What’s in your wallet? Probably not cash.